UPDATED: Thu., Feb. 7, 2019, 10:19 p.m.
TUCSON, Ariz. – David Crisp scored 17 points, Matisse Thybulle added 15 and Washington remained undefeated in Pac-12 play with a 67-60 win over Arizona on Thursday night. 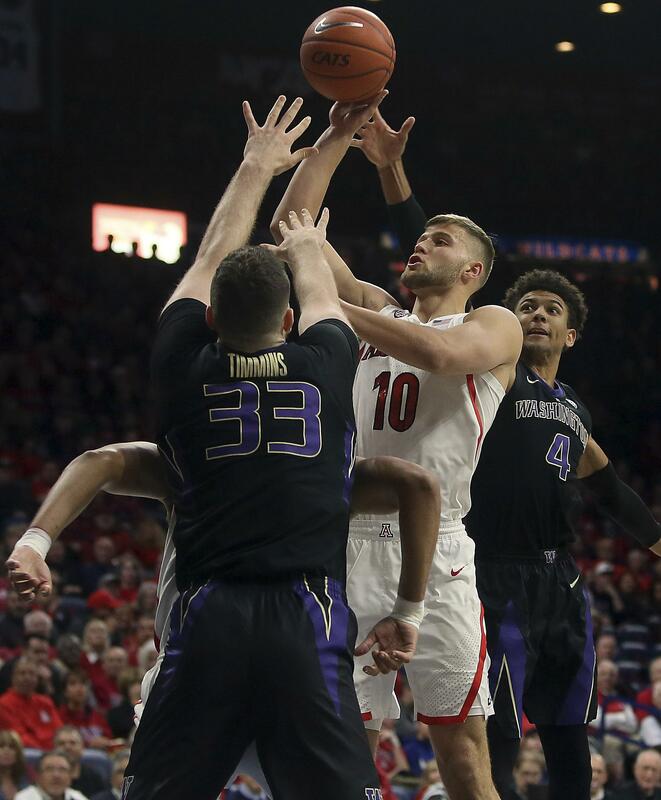 The Huskies (19-4, 10-0 Pac-12) had another impressive defensive night, forcing 20 turnovers while holding Arizona to 37 percent shooting in moving a step closer to clinching the Pac-12 regular-season title. Washington is off to its best conference start since going 14-0 in 1952-53 and has won 12 straight games, all while holding opponents to 70 points or less. The Huskies’ latest win came with big man Noah Dickerson limited by a sprained right ankle suffered Saturday against UCLA. They made up for it by harassing the Wildcats with their 2-3 zone, jumping into passing lanes and contesting shots along the 3-point arc. Thybulle blocked five shots and had five steals. Arizona (14-9, 5-5), coming off an overtime loss to rival Arizona State, played without freshman guard Brandon Williams because of a lingering knee injury and could have used his perimeter shot, finishing 4 for 18 from 3-point range. Washington went through the nonconference schedule 9-4 and rolled through the Pac-12 the first half of the conference season. The Huskies’ three-game lead at the midpoint of the Pac-12 season was the second largest since 1978-79, when the conference went to the 18-game schedule. They’ve done it behind their defense, holding teams to 28 percent shooting from behind the 3-point arc and 61 points during their streak. Arizona held its own against the Huskies in the first half, hitting just enough shots to overcome 11 turnovers to trail 29-28. The shooting luck didn’t continue in the second half, thanks to the swarming Huskies. With Washington contesting every pass and shot, Arizona opened the half 0 for 11 as the Huskies stretched the lead to nine points. The Wildcats managed to hang around for a little while until Washington made six straight shots, going up 59-47 on Thybulle’s corner 3-pointer that forced Arizona coach Sean Miller to call timeout. Published: Feb. 7, 2019, 8:24 p.m. Updated: Feb. 7, 2019, 10:19 p.m.